Michael and Toni have been shooting weddings at San Francisco City Hall for many years with over 400 weddings beautifully photographed. Their combined total weddings photographed is over 1,400! What does this mean? It means we know San Francisco City Hall like the back of our hands. We know where to take you and the best time of the day for beautiful light and less crowds. We can also walk you through the whole marriage check-in process and help with the selection of your ceremony location. In short, we provide you with more than just exceptional photographs, we act as your personal city hall wedding consultants. This allows you to just relax and enjoy your special day. 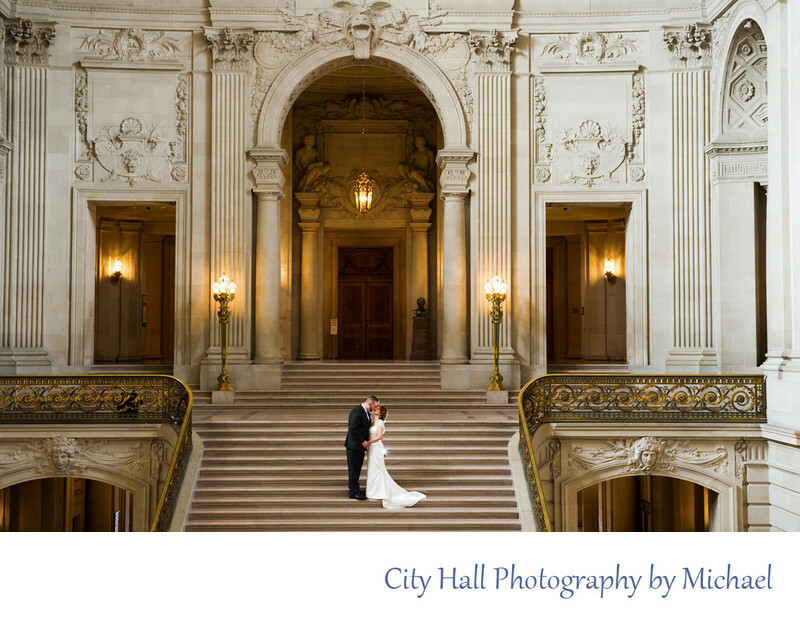 We love to capture the emotion and beauty of your brief stay at San Francisco city hall. Your wedding is one of the most important days of your life and we treat it that way. Our style is easy-going and comfortable, we don't run you all over the building at a super fast pace. Instead, we let you stop and smell the roses, taking in the beauty of the building while making sure we get creative and romantic pictures of you both. We are also careful to find out what some of your favorite things are and why you chose San Francisco City Hall as your wedding venue. Some couples ask us to focus on the architecture of the building, while others want more romance and close up photography. Either way, we give you some of both, but tailor it to your preferences. We want your final result to incorporate both traditional and artistic/photojournalistic pictures. The whole emphasis is to make sure you have a great city hall wedding experience. One of the things that truly sets us apart from many other wedding photographers is that we involve the couple in our art. We talk to you during the shoot and ask you questions, involving you in the process. If you are the type that would rather just sit back and relax, that's great too! Every website you see has an "About Us" page and we are no different. Clients want to know as much as possible about the company and the people before they put down their hard earned money. While we acknowledge the importance of this, what really should be emphasized is not all of our awards and accolades. Instead, the client should know how THEY will be treated and how THEY will benefit from all of our confident words and accomplishments. We do this by asking our clients what they want in their city hall wedding photographer. We don't just dictate to them the photography plan for the day. Yes, we do have a vision for each San Francisco wedding, but if our vision does not match yours then you won't be happy with the results. So not only before the wedding, but during the wedding, we take great pains to communicate with you, ask questions and discover YOUR vision. We want this photo shoot to be About You! If you want to schedule a pre-wedding consultation to discuss your preferences and vision, just let us know. We are happy to take the time to meet with you and share ideas. Frequently, this "meeting" is done over the phone and that works fine! 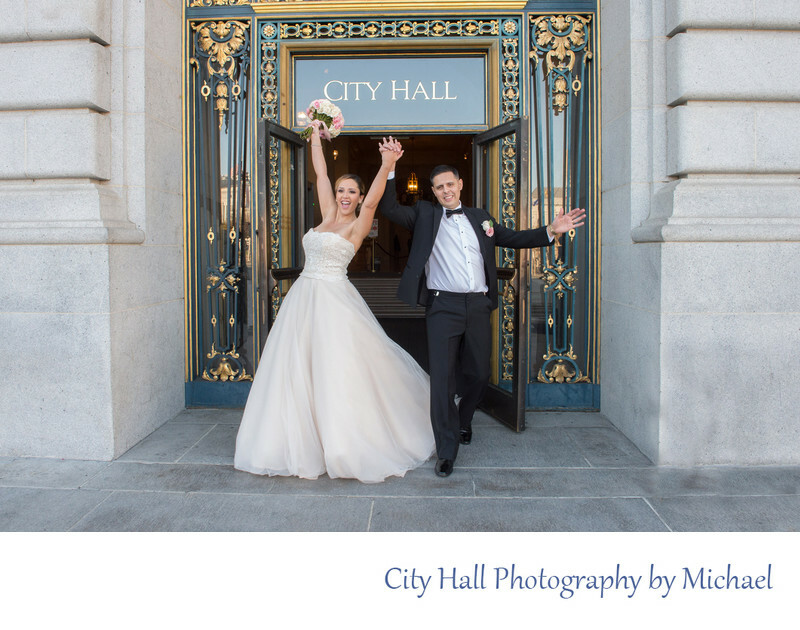 Some of our best San Francisco city hall photo shoots were accomplished with major input from the couple. Don't be afraid to step on our toes, we welcome your input and creativity! If you would rather not be involved, that is fine too! Our 20+ years of wedding photography experience ensures that you will have a stress-free day. We do everything in our power to make your wedding day enjoyable. Your final photos will reflect the fact that you were relaxed and had a great time at your own city hall wedding. This is more important than great poses and backgrounds. In addition, we have seen it all at San Francisco city hall, nothing phases us! Many of our couples tell us that working with us was the best part of their day. My uncle once owned a very successful catering business in Marin County and his motto was "Be a guest at your own wedding". We want to provide you with this same sort of service. We will calmly take care of every detail that we can to make your wedding day the best it can be. We are committed to providing our clients with an exceptional "wedding photography experience". For us, it's not just about providing our client's with great photos. We want them to thoroughly enjoy the process from beginning to end. Why? Because as everyone knows, wedding photography is a big part of any couple's wedding day. We feel it is our duty to make sure that we do what we can to make it a great day for everyone involved. We do this by not being stressed and being friendly to all of your guests. If you love your photos, but didn't enjoy the process, your memories will reflect this. We never let this happen! We shoot with Nikon equipment and use some of the sharpest lenses ever produced. We use fast prime lenses (20mm, 1.8, 35mm 1.8. 85mm 1.4, 50mm 1.4, and 180mm 2.8) When necessary for speed of use, we also use our Nikon professional zoom lenses including a 24-70 2.8 and my favorite for city hall: The 16-35 4.0 Nikon VR lens which we use for architecture shots. We use umbrellas to bring in soft light, but also take advantage of the beautiful natural light at San Francisco City Hall. We use high powered, radio slaves to remotely fire our flashes. We can remotely fire a flash clear across the city hall interior, allowing us to create dramatic light in some of your images. Our Camera bodies include a Nikon D4s, D800, D750, D800E, D7100 and a D7200. We carry a full compliment of back up equipment, including flashes, camera bodies and extra lenses. We are always upgrading our camera equipment to make sure we possess the latest innovations and technology. We acknowledge that exceptional professional wedding photography really isn't about the quality of the equipment so we don't obsess about it. But you as our customer can be confident that we have today's technology and are not operating with old cameras that are technologically inferior. We are a San Francisco City Hall approved "featured" wedding vendor. This means we have submitted the appropriate paperwork and meet or exceed the necessary insurance coverage (for private events). We were hand selected by the San Francisco city hall event staff for inclusion in their new marketing brochure. In addition, we supplied all of the wedding photos that were used in the brochure! We have solid contacts with the event staff at San Francisco City Hall which often helps us do our job more effectively. We are often tipped off to coming events and attractions at city hall that could disrupt our photo shoot. This knowledge might allow us to bring the bride and groom, for example, to the Grand Staircase before we normally would because we have heard that it is being closed off. Let's talk a little more about lighting. We are often asked by clients: "Why do you carry that big umbrella light around city hall with you?" Then they will point to so many of the other photographers at city hall walking around with just a camera body without even a small flash unit. Isn't the natural light at San Francisco City Hall beautiful? Everyone says it is. Well here are the facts....... Sometimes there is NO light at city hall! Sometimes it's foggy outside (foggy in San Francisco?). Toni and I have walked into City Hall for a late afternoon wedding in the winter and it actually appeard dark. So how does a wedding photographer combat that? What if they want to shoot straight into a blown out window, but have no lighting equipment. The answer..... they can't! The answer to all these potential problems is professional lighting, both on camera and off. We use soft lighting with our umbrellas and also bounce our on-camera flashes off of the nice neutral walls at city hall. Doing this turns San Francisco city hall into our own private photography studio. Yes, we offer our clients studio quality photographs no matter what the weather outside is or how late in the evening the wedding happens to be. When the natural light is beautiful, you can bet we use it, but when we want to get a dramatic photo with the backdrop of the amazing 4th floor gallery giant window, we use lights. Check out the lighting in most of our photos, you will note that it almost always appears soft and not "flashy". If you have any questions about lighting, please call us or send us an email. The right type of lighting is what sets the professional photographers apart from everyone else. If you can tell from the photo that a wedding photographer used a flash, then you need to find a different company. "I'm rarely photogenic but with Mike and Toni posing us and capturing us at the right angles, we couldn't be more thrilled with the results. 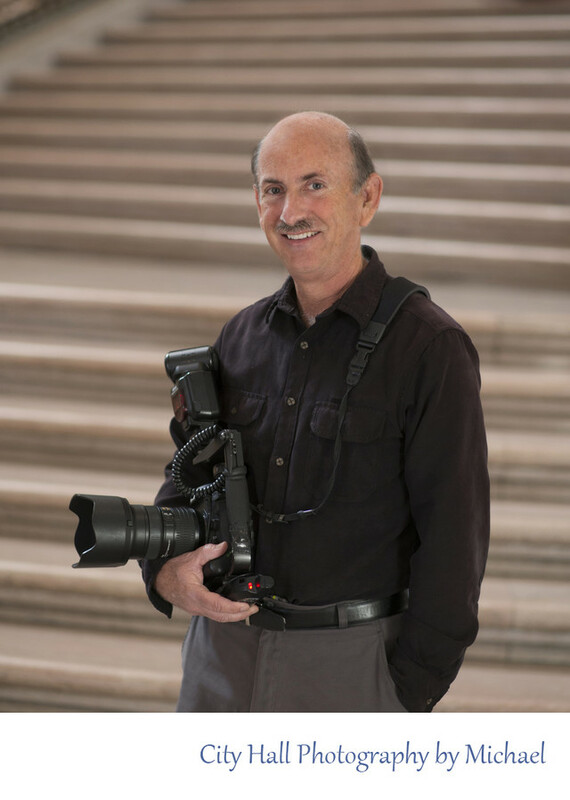 In addition, their price was more reasonable than other SF city hall photographers." "They truly captured the day for us and I can't say or praise them enough for making it special. Providing us with so many photos that we are able to share with family and friend and enjoy for years to come. Thank you Mike and Toni!!" "Mike and Toni were so much more than just our photographers as they helped with knowing the order of what to do to register and locations. It was literally like we had a couple of wedding planners meaning we could relax and enjoy." "Absolutely wonderful! As a passionate photographer myself, I had browsed a lot before choosing my wedding photographer and I made the right choice with Mike and Toni. Look no further. 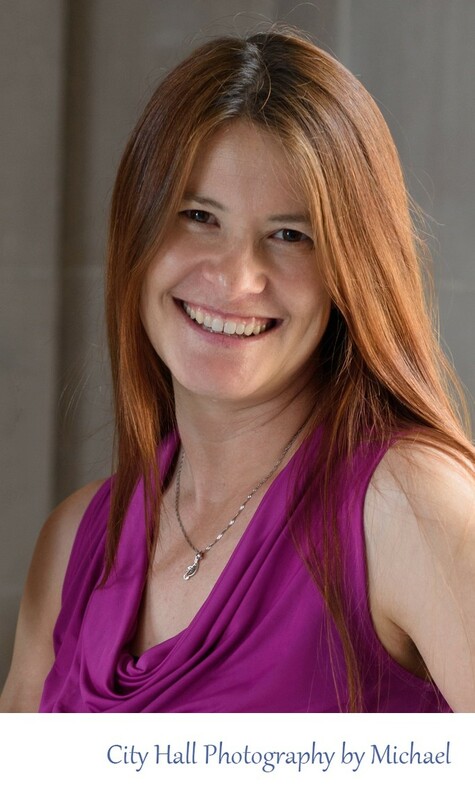 I have been a very demanding customer, organizing my entire wedding from London and yet they have been incredibly helpful, arranging phone calls and trading emails to make sure everything was perfect and it was." As of April of 2019 we are one of the highest rated San Francisco city hall wedding photographers. You will find Yelp's Top 10 lists at the beginning of most Google searches these days. So if you click on that result, it will take right to Yelp's current list of city hall photographers (or whatever you are currently searching for). As of April we are number 1! This could fluctuate and will keep checking to make sure it doesnt change. Please understand that Yelp's rankings can be a bit arbitrary and really don't amount to a true third party endorsement that promises you have found the wedding photographer. But it IS an honor to be mentioned and it shows that we are competitive and continue to obtain top notch reviews from our clients. Ask perspective wedding photographers if they have liability insurance. Not important? It definitely is. What if something gets broken during your event and the photographer is to blame but can't pay. Who do you think will be stuck with the bill? We carry a 1 million insurance policy with a major California Insurance company. After loading your images on to our Computer for editing purposes, we temporarily keep the back up CF card until you have the images in your possession. Your image files also remain on our main hard drive for 1 year (2 on-site locations for 1 year). The moment your image files are loaded on to our computer, they simultaneously are backed up to an off-site location. This protects your image files in case of fire, theft or damage. Your images are on the cloud! When we upload your digital images to your online viewing site, the files are sent there with full resolution. This creates still another back-up which lasts for 18 months. When it is all said and done, we have 2 permanent back ups in our possession. We obviously hope that you take good care of your image files as well after you receive them. Are these measures taken by other city hall wedding photographers? Certainly! Many of them are very careful with the image files and have suitable backup systems similar to ours. Do ALL professional photographers have a system as redundant as ours? You can be the judge, but I encourage you to ask the right questions when you interview a perspective wedding photographer. I recently had a potential client very politely get back to me telling me that they were NOT going to book me because they found someone else with a lower price. Of course I had to wonder if they used other criteria to determine this all-important choice. Either way, one thing remains clear.... A good back-up system is more valuable then saving 50 bucks on a cheaper and inexperienced photographer.